You’ve stocked up on your shirts now it’s time to add some new trousers to your wardrobe. 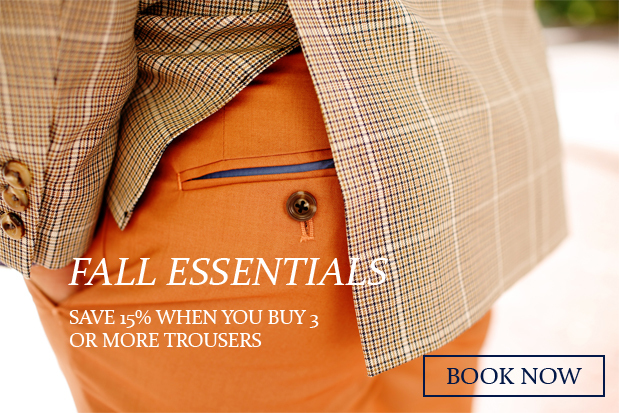 For a limited time, when you buy 3 or more pairs of pants you’ll receive 15% off your order. Stock up on your everyday essentials such as greys and blues or step outside the box a bit and try a new pattern. The possibilities are endless! To schedule an appointment email us at info@9tailors or give us a call at 617-286-6135. Must purchase all 3+ pairs of pants during the same appointment.